The US has exempted anti-dumping tariffs for 31 shrimp exporters of Viet Nam in the 13th period of review (POR 13), according to the Viet Nam Association of Seafood Exporters and Producers (VASEP). The US Department of Commerce (DoC) has recently announced the preliminary results of the POR 13 reviewing the anti-dumping tariff on Vietnamese warm-water shrimp exported to the US in the period from February 1, 2017 to January 31, 2018. The DoC concluded that frozen shrimp products of two mandatory respondents in the review, Sao Ta Foods JSC (Fimex VN) and Nha Trang Seaproduct Company, did not violate anti-dumping regulations in this period. Therefore, preliminary tariffs on those two companies and other 29 local shrimp exporters will stand at zero per cent. The preliminary tariffs serve as a foundation for Vietnamese exporters to obtain the lowest anti-dumping tariffs in the final results of the POR 13, helping the firms thrive in the US market. Truong Dinh Hoe, VASEP General Secretary, said this preliminary tariff would encourage local businesses to promote shrimp exports to the US in the coming months because they had faced many challenges in exporting this kind of seafood to the US, including anti-dumping tariffs. 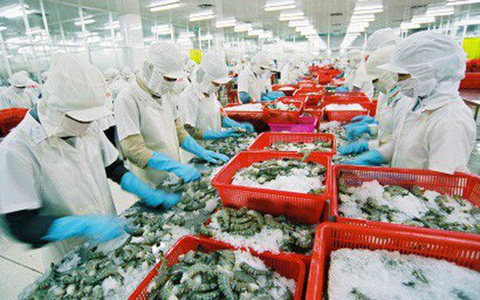 He said Viet Nam's shrimp export target to the US this year was US$600 million but, as of March 15, the nation’s shrimp export value to this market reached $80 million, a year-on-year reduction of 16.8 per cent. If the zero tax rate is kept unchanged in the final decision, this will really boost Viet Nam’s shrimp exports to the US in the fourth quarter of this year and beyond. Tran Van Linh, General Director of Thuan Phuoc Seafood and Trading Joint Stock Company, said this result had showed that Vietnamese enterprises had done well in providing documents and data, proving Vietnamese shrimp were not dumped. The existing challenges for Vietnamese shrimp in the US market included direct competition with shrimp from India, Indonesia and Ecuador, and a high anti-dumping tariff of 4.58 per cent in POR 12, according to the association. From now until September this year, when the final decision on tariff for POR 13 will be released, the local shrimp exporters continue to pay tax at 4.58 per cent of POR 12. To deal with fierce competition from India and reduction in consumption on the US market, Viet Nam’s shrimp industry would need to focus on processing high-value added products, Hoe said.